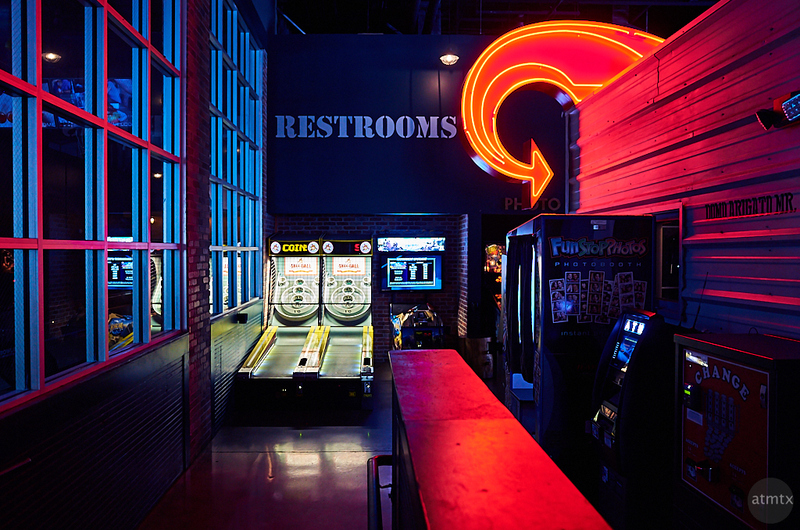 There’s no mistaking where the restrooms are at Punch Ball Social. I like how they used the dynamic red neon as a design element. I shot this about a month and half ago, during an outing with co-workers. The combination restaurant and entertainment venue has some worthwhile photographic interest, which I captured in these two previous posts, Industrial Kitsch and The Long Bar. The Ricoh GR, with its large sensor, is finally fulfilling its promise of higher quality images from a compact form factor. This is mainly due my new Capture One image processing software that allows me to do more sophisticated RAW processing. With the available elaborate color tweaks, I can correct the generally lackluster color of the GR. The camera works well in these “night on the town” situations when I want a capable camera that doesn’t require a camera bag and looks somewhat like a mild-mannered point and shoot. I would love to use the same techniques to optimize dynamic range, that I’m doing with the Olympus cameras, but the lack of image stabilization really hurts. I shot this at ISO 500 at 1/20 of a second. That’s about the limit of what I can reliably hand-hold with this 28mm equivalent lens. With capable image stabilization, I should be able to shoot at about 1/5 of a second or slower and shoot at around ISO 100. At the base ISO, that would give me the best dynamic range. The larger APS-C sensor on the Ricoh, however, should give me slightly more latitude than micro 4/3, at least in theory.